Many regions in the world are experiencing changes in precipitation pattern, which likely impact soil nitrogen cycling and availability. However, we know little about how soil nitrogen processes respond to drought stress under climate change. A continuous 5-year experiment of throughfall reduction treatment (TRT) was conducted in a Castanopsis hystrix plantation in subtropical China to assess how soil nitrogen processes responded to a change in precipitation. Net nitrogen transformation, soil properties, microbial biomass carbon (MBC) and nitrogen (MBN), and microbial community phospholipid fatty acids (PLFAs as bacteria, fungi and arbuscular mycorrhizal fungi (AMF)) were investigated in the wet and dry seasons over the period of the manipulation experiment. TRT had no significant effects on net ammonification rate (NAR) and nitrogen mineralization rate (NMR), and the unchanged NAR and NMR were mainly caused by the no change of soil nitrogen availability (i.e. NH4+-N, NO3−-N and dissolved organic nitrogen). However, TRT significantly increased net nitrification rate (NNR) in the wet season primarily due to the increase in NO3− concentration, and might be further caused by reduced NO3− leaching, denitrification or NO3−-N uptake in the TRT. Differently, TRT significantly decreased the NNR in the dry season, which might be linked to the limited SWC that resulted in greater microbial nitrate immobilization than gross nitrate mineralization. 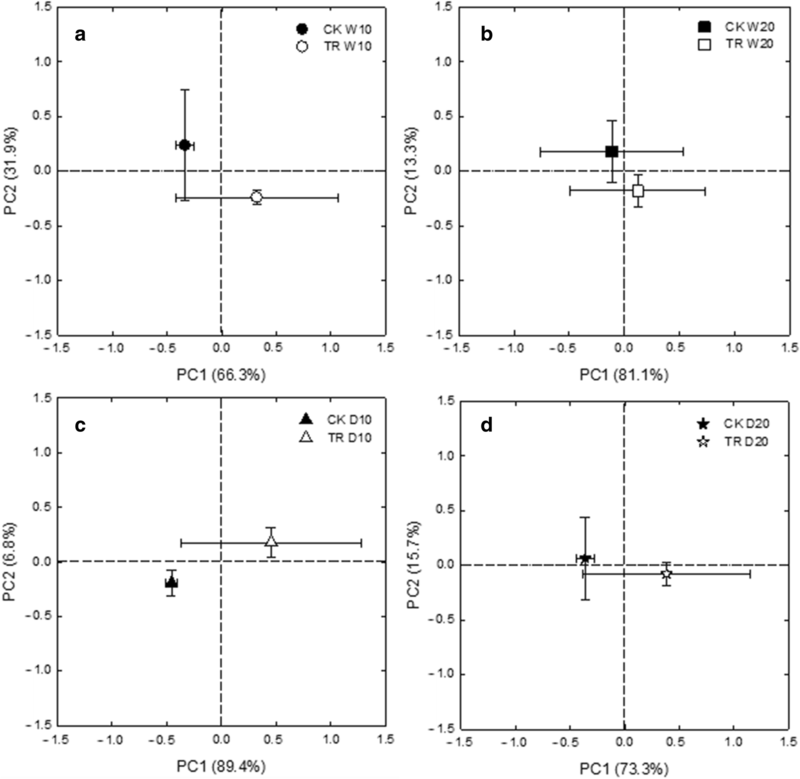 In addition, TRT significantly influenced the soil microbial community composition in 0–10 cm soil layer in the wet season, primarily due to the variations in NO3−-N, DOC and DON. Precipitation reduction affected the NNR rather than NAR and NMR, and consequently, further affected soil N availability and N uptake by Castanopsis hystrix. Climate change resulting largely from human activities has led to changes in global precipitation patterns. Winter precipitation is increasing in the northern hemisphere, while subtropical precipitation tends to decrease; in addition, the intensity and frequency of extreme precipitation events such as drought are increasing (IPCC 2013; Ding 2016), which will alter biogeochemical cycling across diverse ecosystems in the world (Nielsen and Ball 2015; Homyak et al. 2017). Net nitrogen (N) mineralization is a major process supplying available N to plants and is also linked to many environmental issues (Durán et al. 2016; Liu et al. 2016). Precipitation is regarded as a crucial factor influencing soil net N mineralization via substrate diffusion, NO3− leaching as well as microbial N transformation and plant N uptake (Jongen et al. 2013; Cregger et al. 2014). Hence, understanding the effect of precipitation change on soil N cycling will provide a particularly valuable insight into the future change in N supply under climate change scenarios. Net N mineralization is the balance of gross N mineralization and microbial N immobilization, which is regulated by abiotic and biotic factors, such as precipitation, temperature, soil properties, microbial biomass and enzyme activity (Carlyle and Nambiar 2001; Lupon et al. 2016; Huang et al. 2018; Yokobe et al. 2018). A number of field studies suggested that precipitation change may impact soil water content, the physiological performance of microbes and the diffusion of nutrients, which in turn alter soil N cycling and availability (Chen et al. 2017), whereas other studies indicate that net N mineralization is not sensitive to precipitation under field conditions due to different reasons, such as the drought-resistant ability of microorganism (Yuste et al. 2014; Felsmann et al. 2015), no change in aboveground net primary productivity (Jongen et al. 2013) or reduction of the temperature sensitivity (Q10) of N mineralization (Auyeung et al. 2013). Seasonal drought is expected to increase under the scenarios of climate change in many regions of the world (Auyeung et al. 2013; Wang et al. 2016; Kamruzzaman et al. 2017), and soil water content, C and N availability, and microbial activity controlled by precipitation seem to be the main factors determining soil N cycling and N availability (Homyak et al. 2017). Landesman and Dighton (2010) found changing precipitation amount affected NMR in a season-dependent way in the New Jersey Pinelands, which could be explained by the changes in soil moisture, microbial physical demand and substrate diffusion. A reduction in net N mineralization was found in water removal plots relative to water addition plots beneath piñon and juniper (Pinus edulis-Juniperus monosperma) woodland (Cregger et al. 2014), which might be associated with decreased microbial activity or plant N uptake under dry conditions. Additionally, Chen et al. (2017) reported that reducing dry-season precipitation and increasing wet-season precipitation affected net nitrification and N mineralization through altering functional microbial abundance (archaeal amoA genes) and microbial biomass carbon, which were further caused by the changes in extractable organic carbon and ammonia availability in a subtropical forest. Because of different experimental designs and site conditions, the responses of soil N cycling to precipitation change and the underlying mechanism remain unclear. There is a need to carry out further study on N mineralization processes in response to seasonal precipitation change, which is helpful to develop adaptation and mitigation strategies to ensure soil N availability and forest productivity. In this study, we conducted a field throughfall reduction experiment in a Castanopsis hystrix plantation of subtropical China to investigate net N transformation rates along with soil properties, microbial biomass and community composition at two soil depths (0–10 cm and 10–20 cm) in the wet and dry seasons. The objectives of this study were to determine: (1) if the net N mineralization rates in different soil depths and seasons could be reduced by throughfall reduction; (2) how the decreasing precipitation could affect soil N cycling process. We hypothesized that (1) soil N transformation rates would be lower in TRT than in the control, and (2) soil water content and microbial activity would be the main drivers for the changes of N transformation processes. The study site was located in the Experimental Center of Tropical Forestry, Chinese Academy of Forestry, Pingxiang in China (22.10° N latitude, 106.50° E longitude, 550 m a.s.l.). The climate is a subtropical monsoon climate, with the average annual air temperature of 21.7°C. The mean annual precipitation is 1360 mm, of which 78% of the rainfall occurs from May to September. The soil is classified as Oxisol according to the USDA Soil Taxonomy (USDA, 1992) and soil texture is clay loam, consisting of 33% clay, 33% silt and 34% sand, respectively. The experimental stand is Castanopsis hystrix plantation, which was established in 1983. The average stand density, tree height and diameter at breast height were 334 trees∙ha− 1, 21.3 m and 27.9 cm, respectively in December 2017. Understory vegetation is scattered, consisting of naturally regenerated Castanopsis hystrix saplings, Antidesma fordii, Psychotria rubra, Embelia laeta, Adiantum flabellulatum, Lophatherum gracile and Dicranopteris linearis. A manipulated throughfall reduction experiment was carried out in September 2012 with a random design of the total 6 plots including the three throughfall reduction treatment (TRT) plots and the three control plots. Each plot was 20 m × 20 m and the closest plots were 30 m apart (Chen et al. 2018; Yang et al. 2018). The TRT was designed to exclude 50% throughfall with rain exclusion roofs, consisting of a metal frame with a 150-μm-thick transparent film. Each roof was made of transparent membranes (3 m in length and 0.3 m in width), covering an area of 50% suspended on stainless steels above the ground at the height of 1.0–1.5 m (downhill) and 3.0–3.5 m (uphill). The intercepted throughfall were discharged through three water channels (0.2–0.4 m in width and 0.4 m in height) in the treatment plot. Additionally, a plastic foil was buried to a depth of 1 m and a cement wall (0.1 m in width, 0.3 m above the ground, and 1 m into the soil in the uphill and 0.3 m in the downhill) was built around the treatment plot to prevent surface runoff and inflow water outside flowing into the plot. To remove possible effects of installations, the same frame with 2–3 mm white gauze was placed on the control plots. The litter on the plastic membranes, gauze and water channels were returned to the forest floor monthly by hand. Soil samples were collected on 26 June (wet season) and 25 December 2017 (dry season), respectively, with manual removal of the surface litter layer. Samples were taken from soil depths of 0–10 cm and 10–20 cm using a 5-cm diameter stainless steel soil cylinder at six randomly selected locations in each plot. Soil samples collected at the same soil depth in each plot were combined. A total of 12 mixed soil samples (six plots with two soil layers) were collected at each sampling time. After removing stones and coarse roots, each sample was sieved to 2 mm mesh size and used for determination of soil properties, microbial biomass and microbial community phospholipid fatty acids (PLFAs). Soil water content (SWC) was performed gravimetrically by oven drying (105 °C for 48 h) 20 g of fresh soil sample. Soil temperature at a depth of 20 cm was determined by a TDR measurement (TRIME-FM Version 3, IMKO GmbH, Ettlingen, Germany) and data were recorded at one-hour intervals in 2017. The NH4+-N and NO3−-N were analyzed by colorimetry by a flow injection analyzer (SEAL AA3, Norderstedt, Germany). The pH was measured in a 1:2.5 soil/water suspension. Total N (TN) was assessed by the total Kjeldahl N procedure (Bremner and Mulvaney 1982) and determined by the diffusion method. Dissolved organic nitrogen (DON) was calculated indirectly by subtracting inorganic N from total N. Soil organic carbon (SOC) was determined by oxidation with acidic potassium dichromate (Nelson and Sommers 1982). Dissolved organic carbon (DOC) was performed with a TOC-analyzer (TOC-VCSH analyzer, Shimadzu, Japan). Microbial biomass carbon (MBC) and microbial biomass nitrogen (MBN) were estimated by chloroform fumigation-extraction (Bailey et al. 2002). The microbial community was analyzed for PLFAs using the method described by Cusack et al. (2011). The relative abundance of individual fatty acid was expressed as mol % in each sample. The 15:00, 17:00, i14:0, a15:0, i15:0, i16:0, a17:0, i17:0, 16:1w9c, 16:1w7c, cy17:0, cy19:0, 17:1w8c and 18:1w7c represented bacteria (Zogg et al. 1997). The fungi were identified by the 18:1w9c, 18:2w6,9c and 16:1w5c, and among them 16:1w5c was used as a bio-marker for arbuscular mycorrhizal fungi (AMF) (Frostegård et al. 1993). Other PLFAs such as 10Me16:0, 10Me17:0, 10Me18:0, 14:00, 16:00, 18:00 and 16:1 2OH were also used to analyze the composition of the microbial community. Net N mineralization rate was determined by the in situ closed capped coring method (Tsui and Chen 2010) in four incubation periods (26 June – 31 July 2017, 29 September – 26 October 2017, 25 December 2017 – 23 January 2018, and 30 March – 02 May 2018). At the beginning of each incubation, six paired PVC tubes (5 cm in diameter and 28 cm in length) were driven into the soil, leaving 8 cm above the soil surface in each plot. The holes were drilled in four directions at 2.5 cm of the nozzle to ensure gas exchange and facilitate soil sampling. The caps were used to prevent nutrient leaching by rainfall. Six cores were taken immediately from soil depths of 0–10 cm and 10–20 cm and mixed at the same soil layer to determine initial SWC, NH4+-N and NO3−-N concentrations. The remaining tubes with closed caps were left in the field and collected at the end of each incubation period for the measurement of final SWC, NH4+-N and NO3−-N concentrations. Net ammonification rate (NAR) and net nitrification rate (NNR) were calculated by the accumulation of NH4+-N and NO3−-N concentrations for each incubation period. Net N mineralization rate (NMR) was the sum of NAR and NNR (Kolberg et al. 1997). Data were log transformed to meet assumptions of normality and homogeneity of variances where necessary. Comparisons of soil properties, microbial biomass and community PLFAs (mol %), and net N transformation rates between TRT and the control were examined using an independent-samples t test. Pearson correlation coefficient was used to evaluate the relationships of net N transformation rates against soil properties, microbial biomass and community composition. Above analyses were conducted using SPSS 16.0. To visualize the PLFA profiles, twenty-four individual PLFAs (mol %) were subjected to principal component analysis (PCA) using Canoco for windows 4.5 and the graph was prepared using OriginPro 8.0 and SigmaPlot 11.0. We also performed redundancy analysis (RDA) to quantify the correlations between soil microbial community composition and soil variables using Canoco for windows 4.5. The RDA was based on a covariance matrix, where abundance of individual lipids was centered. Both species and environment data were not transformed in prior to analysis. An automatic selection of environmental factors and Monte Carlo Permutation tests were performed to test whether environmental factors were significant (P < 0.05) in explaining microbial community composition. The SWC at soil depths of 0–10 cm and 10–20 cm were 17.5% and 11.5% lower in the TRT than in the control, respectively (Fig. 1a and b). However, the soil temperature at 0–20 cm depth was not significantly different between the TRT and the control. The NH4+-N and NO3−-N concentrations exhibited the similar patterns between the TRT and the control over time, and they were relatively higher in the wet season (June – October 2017) than in dry season (January – May 2018) (Fig. 1). In addition, the NH4+-N concentrations at soil depths of 0–10 cm and 10–20 cm were not significantly different between the TRT and the control (Fig. 1c and d). However, the NO3−-N concentration was significantly higher in the TRT than in the control, occurring only in July 2017 at soil depth 0–10 cm (Fig. 1e). The pH, C/N ratio and DOC were significantly affected by TRT depending on seasons and soil depths (Table 1). The pH at 0–10 cm depth in the dry season was significantly higher in the TRT than in the control, while the C/N ratio and DOC at 10–20 cm depth in wet season were significantly lower in the TRT than in the control. However, the SOC, TN and DON were not significantly different between the TRT and the control either in the wet or the dry season regardless of soil layers (Table 1). The TRT had significant effects on the MBC and MBC:MBN ratio depending on soil depths in the wet season (Table 2). For instance, the MBC at 10–20 cm depth and the MBC/MBN ratio at 0–10 cm depth were significantly lower in the TRT than in the control. In the dry season, however, there were no significant differences in the MBC and the MBC/MBN ratio between the treatments regardless of soil layers. The PCA analysis based on soil microbial groups as indicated by PLFA biomarkers clearly separated the TRT and the control, reflecting a significant effect of TRT on soil microbial community composition (Fig. 2). The first principal component (PC1) accounted for 66.3%–89.4% and the second component (PC2) for 6.8%–31.9% of the total variation, depending on different soil layers and seasons (Fig. 2). According to the RDA, the NO3−-N, DOC and DON played significant roles in soil microbial community at 0–10 cm soil layer in the wet season (Fig. 3a). The first and second axes accounted for 66.3% and 31.9%, respectively, of the total variation in the relationship between microbial community and soil properties (Fig. 3a). Moreover, the relative lower AMF PLFAs was observed in the TRT than in the control at soil depth of 10–20 cm in the dry season (Table 2). The NMR was dominated by NAR rather than NNR (Fig. 4). There were no differences in the NAR and NMR between the TRT and the control at both soil depths throughout the experiment (Fig. 4a, b, e and f). However, the NNR in the TRT was significantly higher at 0–10 cm depth in June – July 2017 (wet season), while significantly lower at 10–20 cm depth in March – May 2018 (dry season), compared to the control (Fig. 4c and d). Pearson analysis revealled that the NAR and NMR were positively correlated with SWC, NH4+-N and NO3−-N, but negatively correlated with DON (Table 3). In addition, the NNR was positively correlated with SWC, NH4+-N, NO3−-N, TN and MBN. In general, precipitation will indirectly affect soil N mineralization via changes in SWC, soil porosity, nitrate leaching, and C and N contents (Paul et al. 2003; Chen et al. 2017). In this study, TRT did not affect the NAR and NMR, and that was similar to those observed in soil available N (i.e. NH4+-N, TN and DON), suggesting that the NAR and NMR were closely related to N supply. This was also demonstrated by the evidence that the NAR and NMR had significant relationships with the concentrations of NH4+-N, NO3−-N and DON (Table 3). Ros et al. (2011) found that the concentration of extractable organic N was positively related to mineralizable N, accounting for 47% of the variation. There were two reasons for explaining why the NH4+-N, TN and DON concentrations were not influenced by the TRT. First, a moderate reduction in SWC was not sufficient to affect soil N supply under in-situ field conditions, because atmospheric water vapor input into soils can stimulate drought-tolerant microbial processes (Homyak et al. 2017). Second, soil temperature was the major environmental factor affecting soil N availability (Jongen et al. 2013; Liu et al. 2016), while there was no significant difference in soil temperature at 0–20 cm soil depth between the TRT and the control. Precipitation can affect soil net nitrification via water infiltration, nitrate leaching, and activities of nitrifying and denitrifying bacteria, whereas the relationship between precipitation and net nitrification depends on the rainfall frequency, intensity and seasonality (Yahdjian and Sala 2010; Jongen et al. 2013). In the present study, the NNR was significantly influenced by TRT, but the opposite changes occurred in wet and dry season. In the wet season (June – July 2017), the NNR was significantly increased at soil depth of 0–10 cm in the TRT compared to the control. This was partly due to the increase in NO3− concentration (Fig. 1), and further caused by reduced NO3− leaching, denitrification or NO3−-N uptake in the TRT relative to the control (Chen et al. 2017). In the dry season (March – May 2018), the NNR was decreased at soil depth of 10–20 cm in the TRT compared to the control. This might be linked to microbial nitrate immobilization that was greater than gross nitrate mineralization associated with the lower SWC in the TRT (Yokobe et al. 2018). Soil microbe is a key regulator of soil N turnover, and thus soil microbial responses to altered rainfall are likely to be an important feedback on ecosystem N cycling (Nielsen and Ball 2015; Puissant et al. 2015; Li et al. 2017). Unexpectedly, the NAR and NMR exhibited no relationships with microbial biomass and community PLFAs, while NNR was positively correlated with MBN. This demonstrated that the responses of NAR, NMR, NNR and microbial growth to the TRT were asynchronous (Song et al. 2017). Dannenmann et al. (2016) showed that gross nitrification rates and nitrate availability were strongly reduced in European beech forests, which could be explained by declines in microbial archaeal amoA abundance and SWC. The response of soil microbial biomass to reduced rainfall was dependent on the change in mean annual precipitation (MAP). For instance, reduced precipitation greatly constrained microbial biomass in the high MAP (> 600 mm), but had little effect on soil microbial biomass in the low MAP (Ren et al. 2017). With a high MAP (1360 mm∙yr.− 1) in this study, the MBC and MBC/MBN ratio at soil depths of 0–10 cm and 10–20 cm were 52.4% and 49.7% lower in TRT than in the control in the wet season, respectively, which might be caused by the declines in the C/N ratio and DOC (Table 2). However, MBC, MBN and MBC/MBN ratio were not constrained by the TRT in the dry season, due probably to the resistance of microbial community to soil drying (Landesman and Dighton 2010; Cregger et al. 2014). Furthermore, the TRT significantly affected soil microbial community composition, and shifting in microbial community composition was primarily attributed to the variations in NO3−-N, DOC and DON at 0–10 cm soil layer in the wet season, similar to the reports by Hong et al. (2016). 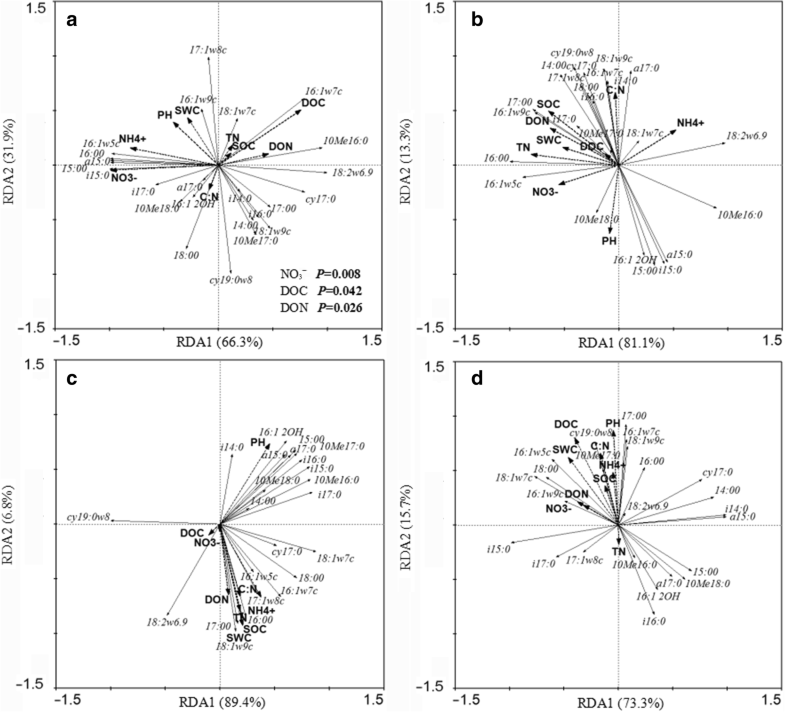 Soil microbial biomass is well correlated with microbial community PLFAs (Bailey et al. 2002). In this study, however, we did not find any relationship between microbial biomass and community PLFAs, since the reduced MBC and MBC/MBN ratio did not induce significant declines in the whole microbial community PLFAs in the wet season. Instead, unchanged MBC, MBN and MBC/MBN ratio were accompanied by significant declines in AMF PLFAs in the dry season. These results showed that microbial biomass and community composition could be decoupled under precipitation change (Zeglin et al. 2013; Ren et al. 2017). Previous studies showed that manipulative drought or alteration of precipitation seasonality will influence the soil fungal and active bacterial, rather than total bacterial communities in forest ecosystems (Castro et al. 2010; Felsmann et al. 2015; He et al. 2017). In this study, in the dry season, the TRT decreased the AMF PLFAs at 10–20 cm soil depth rather than the relative abundances of bacteria and fungi, indicating that potential precipitation reduction in a subtropical forest can more readily influence the AMF, which would further affect host physiology and resource capture of trees through forming a mycorrhizal symbosis (Geßler et al. 2005; Rillig 2010). 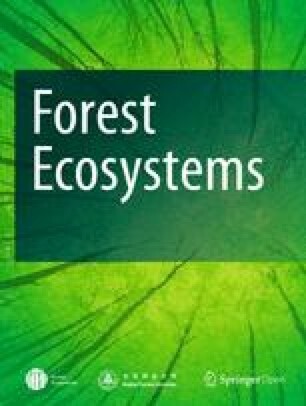 Bennett and Klironomos (2018) reported that there were significant differences between arbuscular mycorrhizal and ectomycorrhizal trees on how water availability affected plant-soil feedback in temperate forests. Taken together, precipitation reduction might influence N balance of C. hystrix plantation by NNR and N uptake capacity of mycorrhizal roots. The measurement of PLFAs provides only a crude measure of changes in the populations of soil organisms and in the future greater effort needs to be placed in quantifying those functional groups of organisms that are most significant in driving changes in soil N mineralization under climate change scenarios. For example, He et al. (2017) manipulated the season of precipitation (decreased in the dry season, increased in the wet season) in a subtropical forest and found that the diversity of the fungal but not the bacterial community declined in the top 10 cm of the soil profile. Whilst the AMF PLFA declined in the dry season in our study, it was not possible from the methodology to identify whether the likely dominant ectomycorrhizal fungi (ECMF) were affected by the TRT. This is important as there are key differences between ECMF and AMF that influence nitrogen cycling. Sulman et al. (2017) hypothesized that the ecosystem carbon balance is sensitive to the mycorrhizal strategies that plants use to acquire nutrients. Overall, the type of mycorrhizal association, the populations of associated free-living decomposing organisms, and the quality of the SOM (Taylor et al. 2016) all influence the extent of soil nitrogen cycling and long-term studies are required to assess any mycorrhizal and ecosystem responses to global climate change (Mohan et al. 2014). 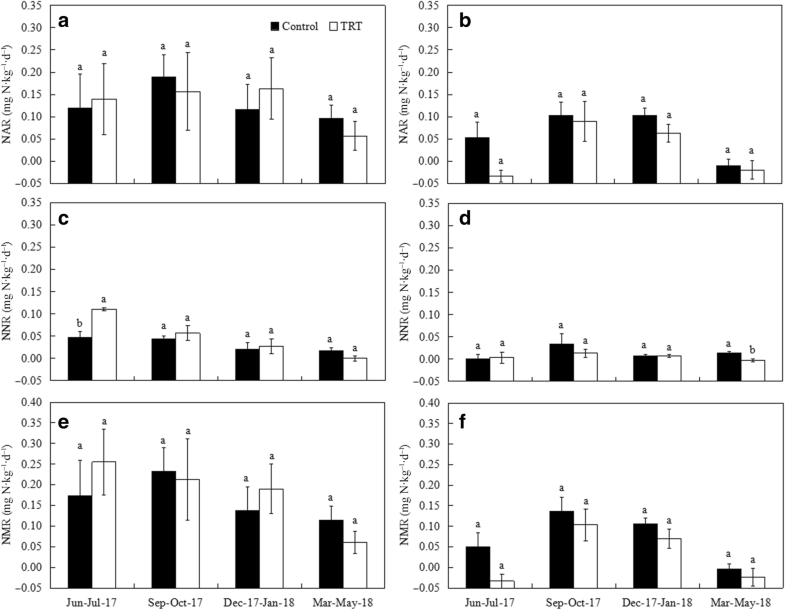 A continuous 5-year experiment in C. hystrix plantation showed that TRT had no significant impacts on NAR and NMR, but significantly affected NNR in a season-dependent way, as indicated that the opposite NNR changes occurred in the wet season and in the dry season. Moreover, NAR and NMR showed significant relationships with concentrations of NH4+-N, NO3−-N and DON, but not with microbial biomass and community PLFAs, suggesting that NAR and NMR were mainly controlled by soil available N. However, the NNR was not only correlated with the SWC, NH4+-N, NO3−-N and TN, but also with the MBN. Additionally, TRT significantly affected the soil community composition in 0–10 cm soil layer in the wet season, primarily caused by the variations in NO3−-N, DOC and DON. There is a need to carry out a further study on impacts of precipitation change on soil N cycling and its mechanisms across forest types in subtropical forests. We would like to thank Jie Zeng for revising the manuscript. We are grateful to Zhaoying Li for soil physiochemical analysis, Hua Li, Liqun Lei and Shiling Liu for soil sampling. This research was jointly funded by the National Natural Science Foundation of China (31290223, 31800533) and Central Research Institute of Basic Research and Public Service Special Operations, Chinese Academy of Forestry (CAFYBB2017QA026), playing the role in the collection, analysis, and interpretation of data; Ministry of Science and Technology of the People’s Republic of China (2015DFA31440, 2018YFC0507300) in writing the manuscript. SL, HW and YW designed this experiment and revised the manuscript; LC carried out the field investigation and drafted the manuscript; JZ conducted the soil sampling; BD and JW edited the manuscript. All authors read and approved the final manuscript.